The Hampton Inn Memphis-Walnut Grove/Baptist Hospital East hotel is conveniently located in a beautiful part of East Memphis, Tennessee and less then a half-mile off Tennessee Interstate 240. Our hotel guests are only minutes from the Memphis Airport, Germantown, Collierville, Cordova and Bartlett, Tennessee, meeting the needs of both business and leisure travelers. Hampton Inn hotel guests will be conveniently located beside Baptist Memorial Hospital and adjacent to the Shelby Farms State Recreational Park in Memphis. Businesses within a mile radius include the Eagle Crest Office building, West Clinic, Semmes-Murphey Clinic and Wunderlich Securities Inc. to name a few. Hampton Inn Memphis hotel guests can enjoy a walk to dine at Sekisui Japanese restaurant, Wendy's, Quizno's, Subway or La Chine Chinese restaurants. Many more restaurants are nearby our Hampton Inn hotel in Memphis, Tennessee. The Memphis Zoo, Brooks Museum of Art, Germantown Performing Arts Center, Elvis' Graceland, Liberty Land and the riverboats are a short drive for our hotel guests at the Memphis, Tennessee Hampton Inn. Sports enthusiasts and shoppers alike will find plenty of attractions in the Memphis area to keep them delighted.The Hampton Inn hotel is a four-story Memphis hotel where our friendly staff awaits your arrival. In our cozy hotel lobby, Hampton Inn hotel guests will find some of our newly added ''Make It Hampton'' additions. These complimentary extras include the hot items of the ''On the House'' breakfast buffet (6am to 10am daily), high-speed wireless internet access throughout the hotel and a USA Today newspaper during the weekdays. Complimentary ''On the Go'' breakfast bags are available at the front desk. The Hampton Inn Memphis, Tennessee offers120 amenity filled rooms which include a coffeemaker, lap desk, hair dryer, iron and ironing board, 25'' cable TV with movie channel, Nintendo and pre-programmed radio, making it easy to find the music you want to hear. Complimentary local phone calls can be made from your room. Upon request and availability, the Hampton Inn hotel offers in-room microwave/refrigerator combos, connecting rooms, cribs, rollaway beds and laundry/valet service for a nominal fee. The Hampton Inn hotel in Memphis, Tennessee features an outdoor pool, over 475 square feet of meeting space with complimentary TV/VCR and screen, complimentary yoga classes (Tuesday and Thursday evenings) and complimentary passes to an area fitness center. Come experience our Tennessee southern hospitality and the convenience of our location at the Hampton Inn hotel in Memphis. 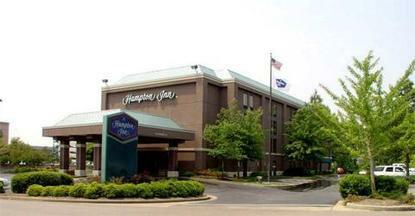 We love having you here at the Hampton Inn hotel in Memphis, Tennessee.